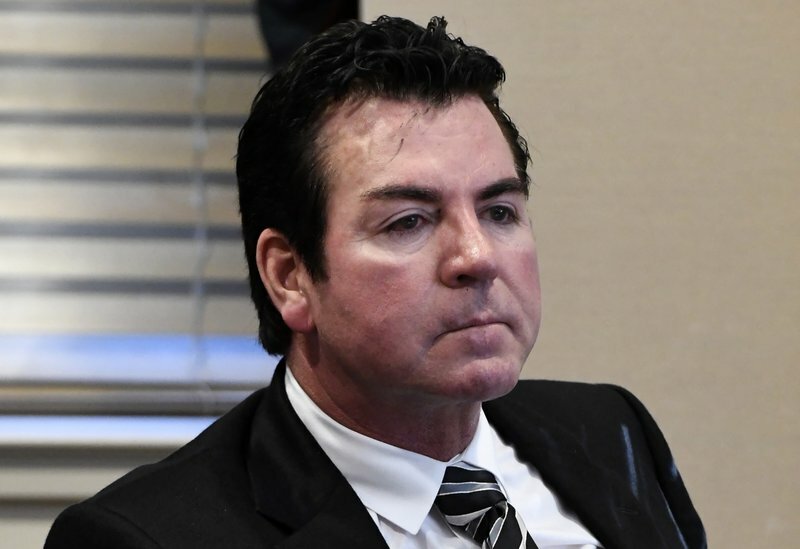 NEW YORK (AP) — Papa John’s founder John Schnatter will step down as CEO next month, about two months after he criticized the NFL leadership over national anthem protests by players — comments for which the company later apologized. Schnatter will be replaced as chief executive by Chief Operating Officer Steve Ritchie on Jan. 1, the company announced Thursday. Schnatter, who appears in the chain’s commercials and on its pizza boxes, remains chairman of the board. He is also the company’s biggest shareholder. Earlier this year, Schnatter blamed slowing sales growth at Papa John’s — an NFL sponsor and advertiser — on the outcry surrounding football players kneeling during the national anthem. Former San Francisco 49ers quarterback Colin Kaepernick had kneeled during the anthem to protest what he said was police mistreatment of black men, and other players started kneeling as well. “The controversy is polarizing the customer, polarizing the country,” Schnatter said during a conference call about the company’s earnings on Nov. 1. Papa John’s apologized two weeks later, after white supremacists praised Schnatter’s comments. The Louisville, Kentucky-based company distanced itself from the group, saying that it did not want them to buy their pizza. Shares of Papa John’s are down about 13 percent since the day before the NFL comments were made, reducing the value of Schnatter’s stake in the company by nearly $84 million. Schnatter owns about 9.5 million shares of Papa John’s International Inc., and his total stake was valued at more than $560 million on Thursday, according to FactSet. The company’s stock is down 30 percent since the beginning of the year. Schnatter, 56, founded Papa John’s more than three decades ago, when he turned a broom closet at his father’s bar into a pizza spot. Since then, it has grown to more than 5,000 locations. Schnatter has also become the face of the company, showing up in TV ads with former football player Peyton Manning. Schnatter stepped away from the CEO role before, in 2005, but returned about three years later. Ritchie said new ads would come out next year. The company said later Thursday that it had “no plans to remove John from our communications,” which it says includes pizza boxes or commercials. The leadership change comes as pizza makers, which once dominated the fast-food delivery business, face tougher competition from hamburger and fried-chicken chains that are expanding their delivery business. McDonald’s Corp., for example, expects to increase delivery from 5,000 of its nearly 14,000 U.S. locations by the end of the year. Ritchie said his focus as CEO will be making it easier for customers to order a Papa John’s pizza from anywhere. That’s a strategy that has worked for Domino’s, which takes orders from tweets, text messages and voice-activated devices, such as Amazon’s Echo. Papa John’s customers can order through Facebook and Apple TV, but Ritchie said he wants the chain to be everywhere customers are. “The world is evolving and changing,” he said. Ritchie, 43, began working at a Papa John’s restaurant 21 years ago, making pizzas and answering phones, the company said. He became a franchise owner in 2006 and owns nine locations. He was named chief operating officer three years ago. Ritchie said plans for him to succeed Schnatter were made after that.